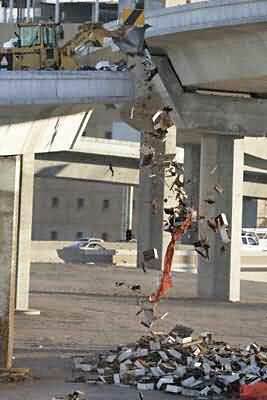 A truck carrying 12 million honeybees hit a wall on a highway ramp on December 15, 2004. 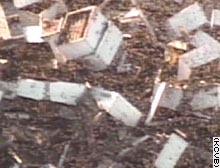 The truck was carrying 480 bee colonies to California to polinate the almond crop when it hit a wall sending the bees toppling over the wall. The bees swarmed on a post below for the overpass. The Las Vegas Fire Department doused the bees with water to kill them. You’d probably be surprised to know how many bees are transported around the country every day. They are critical to polinate many crops including fruits, vegetables, flowers and nuts. Without them we wouldn’t have enough food. 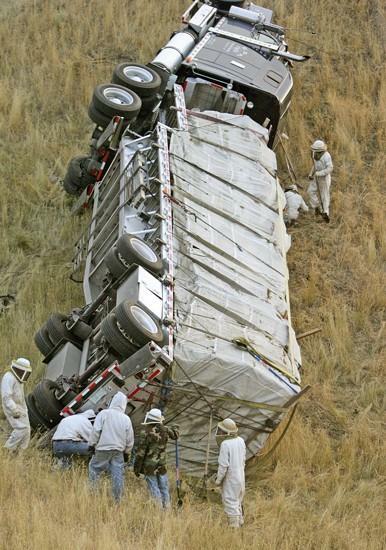 On September 18, 2007, a trailer hauling more than 450 beehives ran off the road and overturned on I-94 near Huntley, Wyoming. 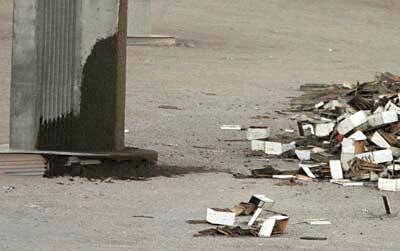 There were as many as 13.7 million bees in the truck and thousands were freed in the accident. The freed bees swarmed in the area. Firefighters had to suit-up in protective gear before being able to free the driver. Several rescuers were stung. As the temperature dropped through the evening, the bees calmed down and beekeepers from the area assisted as they returned to their hives. The driver said he swerved to avoid a reckless driver, but a witness reported that the truck was alone in it’s lane at the time and simply swerved off the freeway. Incidentially, the bee population in the US is under attack from many sources right now. More than a quarter of the US bee colonies have been lost. This is tens of billions of bees. Bees are being lost to mites, suburban sprawl, and a new problem called Colony Collapse Disorder. Colony Collapse Disorder is a recent threat in which bees simply vanish from their hive, sometimes leaving just a queen and a few workers. The strange thing is that none of the creatures that would normally take over a hive and eat all the honey are seen in the abandoned hives. Nobody yet knows what is causing the problem, although theories range from genetically modified crops, cell phone towers, high-voltage transmission lines, and terrorists. One interesting theory is “Bee Rapture”, in which God has recalled them to heaven. With fewer bees, beekeepers are transporting bees more often, and farther to polinate crops.